Kenji Kwok shared his story of his grandfather who took up cobbling and today, he continues to fix shoes from those in the neighbourhood. Some of the stories tell of how times back then were tough and how the older generation never failed to persist. Kenji Kwok, 21, shared about his grandfather who had to wind down a once booming business, Kims Shoes Co, which included four shops, because of hard times and resorted on top of that to borrow money to make ends meet. He then decided to take up cobbling, a trade he still continues to this day at the age of 80. Even with the “usual fluctuating earnings” and bowed legs that hurt when he walks, the “self-motivating family man” pushes his cart out to fix shoes from those in the neighbourhood. 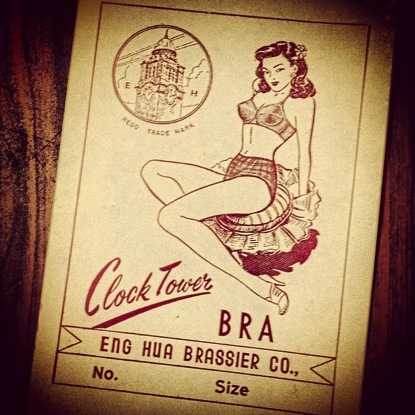 Or the story of Iris Ng’s grandmother, who was an entrepreneur of a bra company called Eng Hua Brassier Co. It started out as a low-cost way to earn income and where she taught herself how to sew bras. From one dozen bras sold for a meagre S$2, her business slowly grew to where she had 10 employees. “My grandmother even became the first and sole supplier of John Little (department store) bras!” said Iris, 22. Her grandmother is still living with her today. These stories and some 231 others, along with pictures, on Instagram were competition submissions under of a student-lead project called “The Silver Yarn Project”. The competition ended on March 1 and will culminate with the announcement of the top four winning stories on March 10 at an event where 30 youth-grandparent pairs will take part in a trishaw ride around Chinatown in an effort to encourage the seniors to share their stories of the past. “The Silver Yarn Project” is a final-year project run by four students from the Wee Kim Wee School of Communications and Information at Nanyang Technological University (NTU) to encourage youths aged 19 to 26 to have stronger ties with their grandparents or elderly who are close to them. According to an informal survey of 250 youths between those ages done by the NTU students to understand the situation on the ground, less than half of them speak to their grandparents on a regular basis. Only 22 percent of them go out with their grandparents at least twice a month. However, there was a silver lining. The students found that 66 percent enjoy spending time with their grandparents and 76 percent wanted more interactions with them. Iris Ng's grandmother's bra company. Added another NTU student, Nicholas Teo, 25, “Even though the youths regard their grandparents as important to them, because they have other things happening in their lives, their grandparents end up at the backseat.” He noted that a story is “the shortest distance between two people, and that they are doorways that connect one generation to the another”. From the stories, Sarah Wan, another NTU student, 22, explained, “We see the grandparents in different light”. Beyond the Instagram competition that was started in January, the students also held campus roadshows to garner more submissions. 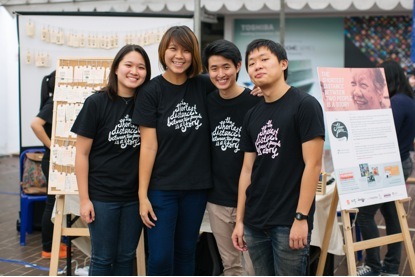 The NTU students who started "The Silver Yarn Project", from left to right – Sarah Wan, Regina Koh, Alan Choong and Nicholas Teo. He had asked his father about his own grandmother and learned that when she was travelling from China to Singapore, she ended up being quarantined for a week at St John’s Island because of protocol. Nonetheless, she found out a lot. She learned that her grandmother lost her sister to leukaemia when she was 15. That she also lost her husband at an early age and as a result, had to support her four young children. Being the “tenacious woman that she was, she ended up buying a plot of land that was located in Queensway”, shared Sarah. The stories that once were meaningful to the older generation, now are just as meaningful to the younger generation.